Rated 5 out of 5 stars by 20 PRO members. ​FSX Honda Jet, registration N420HA. 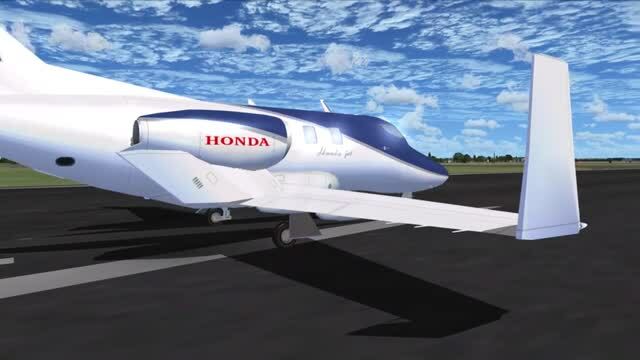 The Honda HA-420 is a six seat, twin-engine light jet capable of 420 knots and an altitude of 41,000 feet. Please move it to the \Microsoft Flight Simulator X\SimObjects\AirplanesSimObjects\Airplanes folder. A shadow is indicated in the body. Remove a check. The archive hondafsx.zip has 51 files and directories contained within it. Everyone likes to fly a jet that takes away from the norm a little bit, right? After all once you have flown one kind of each class of aircraft you’ve “technically” tried them all, yes? Wrong! This aircraft manages to take the conventional wisdom that would usually accompany most FSX aircraft of this size and style, and throws it all in the bin. This is an aircraft that takes a rebellious stance towards the norm, and ensures that anyone who tries this out can get something a little bit more unique than the usual business jets we’re all so used to! However, the most important aspect of flying a Honda jet is the fact that it just feels so different in the cockpit. Whilst it still operates in much the same vein as any other aircraft, the layout and the overall style of the cockpit is a big difference compared to what most of us are used to. If you are looking for an aircraft that’s perhaps a bit more simplistic then this might not be for you, though. It does not really do a great job of following the conventional necessities of the typical simulator pilot, but all credit has to go to the developers of this mod for being able to get the right level of detail and accuracy on just about every aspect of the aircraft. From the way it looks to the way it performs, this is about as close to the tribute act being better than the real thing as you are going to get with a free mod for FSX! The attention to detail in every way is just so impressive; it’s really easy to see all of the little twists and turns that have been included along the way, giving you all the help that you need in just settling into things and getting used to the way that the aircraft flies. Of course, the most important thing for most is just how responsive an aircraft is – are you going to feel as if you are flying something that was made by man? If that is your main concern, then you are in luck. This is a truly epic representative of the aircraft in every single way, and this includes the level of realism that it provides you with. It makes life a whole lot easier this way, giving you total control over what you would be expecting to happen with the aircraft and what is actually happening! Now, you can balance out the reaction that you expect to get from the aircraft more or less flawlessly. This will really help with the overall way that you fly the aircraft, as well as ensuring that you get used to its nature much quicker. In general, the Honda jet is a very interesting project that whilst I certainly found it a little bit awkward at first; I was able to easily get to grips with and now use on a regular basis! can someone tell me how to operate/open the cabin window's curtain? Great plane! Good graphics. Good effects. Good job! It shows on my aircraft selection screen as "Honda Learjet". I have a feeling that the folks at Bombardier might get pretty cranky about that. Why no Primary Display? It's not complete without it. I just discovered this aircraft for fsx. Where's the crossfeed lever/button? This plane only uses fuel from the left tank, even after creating a "fuel crossfeed" hotkey and using it. Anybody else seeing this behavior and corrected it? Love the fact that it's got the g1000; I added another instrument window so that i can pop the MFD out to another screen. It's been my favorite for many, many years. Rediscovered it recently with my renewed interest in FSX, and it's still by far my favorite and the best freeware add-on aircraft I have tried, and the only one I have kept all these years. Love this plane, easy to fly and enjoy all your extra perks. Very easy to download thank you. Great plane but no flight instruments i.e. PFD HSI?? Only panel instrument is the Garmin?? The best plane I have downloaded; has g1000 a vc and vcabin... is it payware?! I tried to download again it says unable to install, installer file is damaged any ideas as to what I'm doing wrong? Great and free!..Good and clear panels, like the Lady copilot... Only for Jet Intl Airports! All your work is beautiful. You should be proud. Great Job. The only issue I had was I kept trying to use it on runways that are too short. Once you pick the correct airports its a great aircraft. i'm lovin it!!!! awsome download. Really fantastic.Every thing is clear and fine to fly without no problem. Cool aircraft, works well, piece of cake download, love those and the co-pilot sweet touch. Excellent machine and one heck of a co-pilot! My new favorite, really nice, thank you! Downloaded great and is fun to fly! Downloaded with no problem and it flies great.